Three of Hamsakutira's differently abled children performed for the prestigious Dhanvantari morning series of concerts organised by Bharatiya Samagaana Sabha at Chowdiah Memorial Hall on Feb 16th, 17th and 18th for a slot of 5 minutes each. Namasthe. Hamsakutira Foundation shall host its annual series 'Nadaprayatna' on sat, 13th jan 2018 at 9.30am at Seva Sadan auditorium, malleshwaram. A very special moment and a divine blessing on 26 nov 2014 to be honoured at Seshadripuram high school by none other than renowned Music and Dance Critic Prof. Mysore V Subramanya. A mentor who has helped me walk at every stage of my music career..
A proud and nostalgic moment to give away the overall shield for best performance to my own school Poorna Prajna High School, Sadashivnagar..
A day to cherish forever. A trip with Hamsakutira's students to Malur-Aprameyaswamy , Nadi Nrusimha, Maddur-Ugra Narasimha, Varadaraja swamy, Pattabhi Rama tmpl, Srirangapatna-Ranganatha, Thondanur kere,Thondanur-Nambi Narayana, Krishna, Yoga Narasimha, Ramanujacharya, Melukote-Dhanushkoti, Yoga Nrusimha on hills, Cheluvanarayanaswamy. 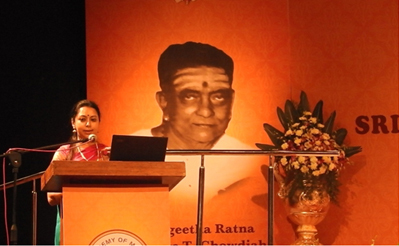 Dr. Geetha R. Bhat, an accomplished and versatile Veena artiste, was initiated into the field of Carnatic music at the tender age of five and took forth to pursue her musical skills through the divine musical string instrument- 'The Veena'. She has been enthralling audiences right from the time she gave her first full- fledged performance at ADA Ranga Mandira, Bengaluru in 1994 and her panorama of research and achievements in the field of “Neuro-Musicology” further emphasizes her intense devotion and dedication as a Carnatic Vainika, vocalist and a therapist. Her vast understanding as a practitioner of both child psychology and carnatic music has enabled her to explore deeper dimensions like Music and Emotions, Music as a promoter of human values, Music and spirituality, music for transforming lives, especially the terminally ill, differently-abled and children with special needs. Having had her initial tutelage in carnatic classical music under Guru Sangeetha Bhooshanam Smt. B. Gnanambal at a very young age, she furthered her ‘senior’ and ‘proficiency’ (vidwat) levels in carnatic music under the guidance of Guru Ganakalabooshana Vidwan Shri R. K Srinivasamurthy and Guru Karanataka Kalashri Smt. E. P. Alamelu. She has also had the divine opportunity of being trained under Guru Shri R.R Keshavamurthyon Dikshitar’s Navagraha kirthanas in vocal. 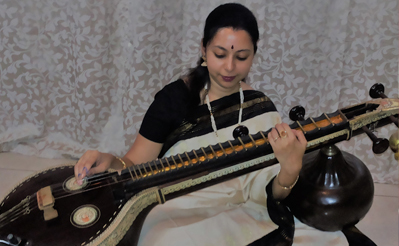 With close to 2.5 plus decades of dedicated practice of the veena, geetha's passion for teaching music and conducting workshops at her Centre, Hamsakutira Foundation is no less than her passion to perform concerts. Some of her interviews and documentaries have been telecasted by channels Praja and Shankara, apart from her concerts in channels doordarshan, udaya tv, udaya news channel, Vijay and Raj tv, Chennai. Her articles on Psychology and Music Therapy have been published by leading newspapers such as "the times of india",The Deccan herald, Prajavani, The Vijay Times (the bangalore mirror) and in magazines Kalasinchana from Ananya, The First Melody from Bharatiya Sama gana Sabha, SamYoga from Ranjani Fine Arts. She was awarded her doctorate for her exclusive research conducted on the effects and benefits of sound, classical music and rhythm on the brain in her study “Neuro-Musicology and the Therapeutic powers of sound and classical music”, awarded to her at the age of 29. Her study emphasizes the relationship of musical activities and the brain, and its benefits in stimulating not only motor therapy, speech and language therapy but also pain management and cognitive rehabilitation in areas of memory, effective function and attention. Her knowledge-sharing talks and presentations at various schools and colleges, Indiranagar Sangeetha Sabha, Bharatiya Samagana Sabha, The Academy of Music, Bengaluru at Chowdiah Memorial Hall, Ideas Conclave at Bharatiya Vidya Bhavan , nightingales enrichment center for senior citizens, Nadamanthana conference at Jain college, Ananya, Malleshwaram, The Deccan International school, Rotary events, etc., has gained her a lot of appreciation. She has also aired a few programmes in AIR, “ Vanitha Vihara” series on Music and Child development and special programmes from the ladies batch of Hamsakutira Foundation for many occasions. She was felicitated by flautist Sangeetha Kalaratna Sri B. Shankar Rao, 95 years during the 32nd Tyagaraja and Purandaradasa Aaradhana celebrations Feb 2017, Dr. D. VeerendraHeggade, a philanthropist and the hereditary administrator/Dharmadhikari of the Dharmasthala Temple in Oct 2016 during Navaratri , Sangeetha Kalaratna Prof. Mysore V Subramanya at Sheshadripuram College on 26th Nov 2014 during the programme in memory of VanikaShikhamani Mysore V Sheshanna and KC Puttanarasayya at the DattiyaSabhangana, by Tuluveruenkulu, Bangalore, under the ageis of Kannada SahithyaParishad in 2014. She was also felicitated by Padmavibhushan Smt Sudha Raghunath, Padmashri Smt. Arundathi Nag, Sri B R Ravishankar as a token of gratitude at the valedictory function by Bharatiya Samagaana Sabha on 19th Feb 2017 at the Chowdiah Memorial Hall.